Playa Vista, Calif. – December 11, 2013 – Belkin, creator of people-inspired technology products, today announced its new Miracast Video Adapter, a small HDMI dongle that wirelessly displays content from an Android phone directly to an HDTV. Miracast mirrors the screen of your Android smartphone, enabling you to enjoy any of your phone’s content, including movies, TV shows, video clips, photos, games or apps, in full HD with plug-and-play simplicity and without messy cables. With a compact, low profile the Belkin Miracast Adapter tucks neatly out of the way while in use and is easily transportable for sharing content on-the-go. It plugs directly into the HDMI port of any HDTV and uses a small USB cord connected to the TV’s USB port for power. For TVs with hard to reach HDMI ports, The Miracast Adapter also comes with an extension cable for easier attachment. Miracast works natively with Android devices running Android 4.2.X or higher, including the Samsung Galaxy S3/S4, Galaxy Note 2 and 3, HTC One, Google Nexus 4/5 and Kindle Fire HDX. Full device compatibility is listed here or check with your device manufacturer. 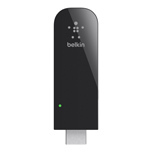 The Belkin Miracast Adapter is available now at Belkin.com and Amazon.com for an MSRP of $79.99.